Convert Office document to image. Edit PDF description and encrypt PDF. 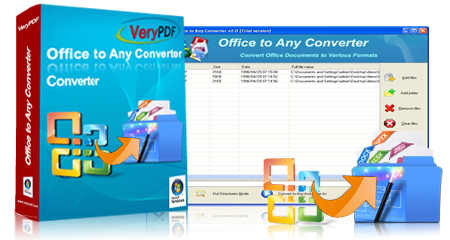 Office to Any Converter is a conversion tool for converting Office documents to other formats. It supports source MS Office documents like Word, Excel and PowerPoint, and target formats like PDF, WMF, and EMF. It also supports to convert one image to another image formats, for example, png to gif. It supports to encrypt, edit description and add watermark for converted PDF. Windows 2000 / XP / Server 2003 / Vista / Server 2008 / 7 / 8 of both 32 and 64-bit. 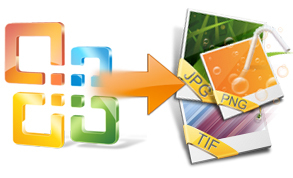 Office to Any Converter can convert Office documents to various image formats. The application supports to set the image color depth, resize the image. For the TIFF output format, Office to Any Converter also supplies many kinds of compression methods. Office to Any Converter can be used to convert any Office documents to PDF documents. It supports to encrypt, edit description and add watermark for converted PDF. Office to Any Converter is able to edit PDF description such as producer, creator, title, subject, author, etc. It also supports to encrypt the PDF document for security. Convert MS Office documents to PDF files in batches. Convert MS Office documents to Postscript, EPS, TIFF, JPG, PNG, etc. files in batches. Supply various compression methods for output TIFF format. Support output formats: PDF, PS, EPS, SWF, XPS, HPGL, PCL, TIF, PNG, JPG, BMP, GIF, TGA, PCX, EMF and WMF. Able to convert Office documents to PDF files without MS Office installed. Able to edit PDF description. Option to encrypt the PDF document. Able to add page number for the output PDF document. Option to add watermark for the PDF document. Option to set color depth and resize image when converting document to image. Converting XPS format to PDF, PS, EPS, JPG, BMP, PNG, PCX, GIF, TGA and TIFF. it supports custom page size, resolution, color depth and compression in conversion. Convert PDF to Word, Excel, PowerPoint, HTML, PS and EPS. To different target formats, this application provides corresponding conversion options. Convert HTML to images, PDF, PS, EPS, and Office document formats in Windows, Mac OS X and Linux.